What a fabulous day .... the salt mine was fascinating ... we had no idea what to expect. And then we went to a favorite winery of yours and what a wonderful afternoon. An excellent lunch and then the wine tastings. We must have sampled 8-10 wines. The owner of the winery was also wonderful. We had so much fun sampling and laughing as well as learning about the wines we were tasting. We were glad you were the designated driver. Again thank you for a wonderful day. We will always remember this day. TOUR GUIDE RESPONSE: Dear Eileen, thank you very much for your kind words. Having been your designated driver was definitely a pleasure and a pain at the same time. A pleasure to have you guys as my guests, a pain for having to watch you tasting all those astonishing wines without being able to join you :). Luckily someone was kind enough to offer me a bottle to taste it at home, after stopping being the designated driver ;). Thank you very much! Very happy with our one day tour with Vlad. Knowledgeable, helpful, patient, very good driver, our day with him flew by. 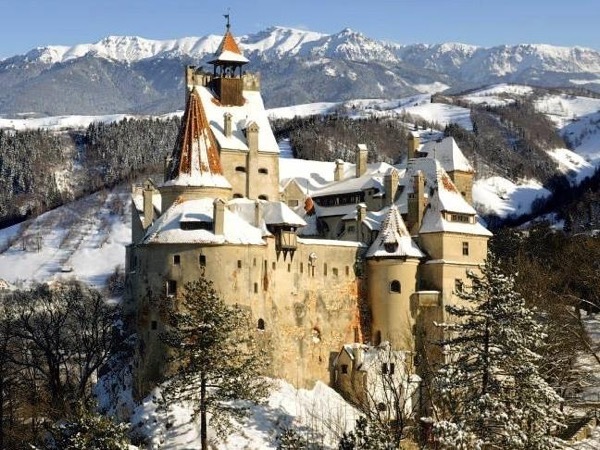 Excellent and comfortable way to discover the highlights of Transylvania on a one day trip from Bucharest. I thoroughly enjoyed the experience. I honestly think noone can deliver it better than Vlad, our friendly and amazing guide. We were especially surprised by Vlad's breadth of knowledge along the journey, pulling out numbers, years, and statistics out of this air like magic, something every tourist needs. His English is impeccable. He was able to describe in detail each and every exhibit using specific terms. We promise ourselves that the next time we are in Romania, we will definitely use Vlad again. TOUR GUIDE RESPONSE: Dear Ferry, thank you for the kind words! I'm so happy that after my first group from Indonesia i already have friends there :). Enjoy the rest of your staying here and don't hesitate to call in case you have any questions! Vlad's tour to Veliko Tarnovo in Bulgaria was delightful. His knowledge of the history of the area is awesome. His information about the Bulgarian people and their culture in comparison to Romania was fascinating. Who else nods "yes" by moving their head side-to-side and "no" up and down? When my wife broke her handbag, he helped her buy a new one. Add to that great restaurants, planned stops, and panoramic views of the Danube and the day was complete. TOUR GUIDE RESPONSE: Dear Franklin, thank you for the kind words! I'm glad that you'll always remember how to say "yes" and "no" to a Bulgarian using body language :). I hope you got back home safe and sound and you are already planning your next visit here :). Best regards! Vlad is passionate about his tours and really tries to enrich the experience by providing a citizen's perspective of the area and current events in his country. TOUR GUIDE RESPONSE: Dear Nathanael, thank you for taking the time and rating the tour! I'm glad you enjoyed the experience! Looking forward to seeing you again! Prompt, intelligent, articulate, and very knowledgeable about Romanian culture, economy, history and geography. Spotless and beautiful vehicle, impeccable driving. A wonderful 12 hour, jam-packed and interesting day trip. Two wonderful castles were explored with Vlad as our informative guide. A most delicious local lunch was enjoyed. We also explored a quaint and lovely town/city (Brasov) on foot. Carpathian Mountains were breathtaking. Vlad was so awesome! TOUR GUIDE RESPONSE: Dear Shayne and Angela, thank you very much not only for the kind words but also for a very pleasant company over the 12 hours. Really hoping to see you back soon! Our time with Vlad was a combination tour and transportation from Bucharest to Veliko Tarnovo, Bulgaria. Vlad was willing to customize for our needs. He took us on a walking tour of Rousse, a delightful lunch in an old fortress, to an old stone church built in the rock and a tour of Tsarevets outside Veliko. He carried our luggage along with us in his very nice car as we planned to stay in Veliko overnight. Vlad is knowledgeable about both Romania and Bulgaria -- though less so about Bulgaria. TOUR GUIDE RESPONSE: Dear Louise, thank you very much for the rating! I hope you had a great time in Bulgaria! Such a relief to come out of the arrival and see Vlad waiting for us with our name on a sign. Beautiful, new vehicle that was comfortable and spotless. Impeccable driving. We stopped off at the Village Museum which is an open-air ethnographic museum. We then did a panoramic tour (by car and on foot) of Bucharest where Vlad pointed out interesting highlights that gave us a great base. Therefore, we spent the next two days going to see many of the items he shared with us on our initial city tour. TOUR GUIDE RESPONSE: Dear Shayne and Angela, i'm glad you enjoyed so much Romania and also my company. Remember, there's much more to discover! Have a safe flight back home! Vlad's tour was the highlight of our trip to Romania! He is knowledgeable and an interesting historian of Romania. He gave many insights about the people, culture, history and economy as well as the tours of all the sites. He was considerate and the car was very comfortable for a long day. The tour left at 9AM and returned about 10PM. Vlad even managed to locate a special treat for me ... an excellent Turkish coffee in Brasov! Unforgettable. Vlad will not disappoint you and will enjoy his company. TOUR GUIDE RESPONSE: Dear Coletta, thank you very much for the kind words! I'm delighted you enjoyed the day. It was a pleasure to chat with you and Joe. I'm just sorry there is no possibility to rank travelers, just the guides. I would have given you 6* outta 5 :). Hugs to both of you and looking forward to seeing you again! There's plenty more to explore and you just made yourselves a friend here! TOUR GUIDE RESPONSE: Thank you for the rating Bianca! Hope you arrived safe and sound back to Japan! Hugs to all of you! TOUR GUIDE RESPONSE: Dear Ivan, thank you for your kind words. Hugs to all 6 of you, especially to your awesome kids! Vlad was a wonderfully, informant tour guide for us 4 seniors. We contacted him to work up a private 3-day tour out of Bucharest. He proposed a great itinerary that included what we asked for, Bran Castle, Peles Castle and Slavic Prahova Salt Mine, and some places he thought would be interesting for us. He told us all about his beautiful country and the history of the places we saw. His suggestion of the Transfagarasan road through the Carpathian Mts was awesome. Vlad was the perfect tour guide!! TOUR GUIDE RESPONSE: Dear Penny, Thank you very much for your kind words. I'm glad to hear that my suggestion worked and i'm delighted to hear you loved Romania so much! Looking forward to seeing you again! I am so glad my travel agent recommended Vlad! Romania was our favorite destination. Together we customized a four day tour for me and my two children, 8 and 12yrs, which included Mamaia Beach, Constanta, Bran and Peles Castles and Bucharest. We even did a half day at the Aquapark. My kids loved it! Vlad was punctual, considerate and insightful. He contacted me a week in advance warning of unseasonal weather. We packed raincoats along with our bathing suits. So much to see and learn about in Romania! TOUR GUIDE RESPONSE: Dear Lindsay, thank you very much for your words. I'm glad i was able to help you achieve your dream :). Please say hello to the kids for me, and looking forward to seeing you again! Vlad was incredibly energetic and his enthusiasm for this tour was contagious. He made sure that we had a lovely day visit to Bulgaria and provided insightful information about the country and culture along the way. I highly recommend this tour. TOUR GUIDE RESPONSE: Thank you for the kind words, Guillermina! I`m glad you had such a pleasant experience, and i`m looking forward to seeing you again! All the best! Vlad was right on time and we learned a great deal. His knowledge is quite extensive and it is a trip worth taking! Be prepared for a fast moving long day but you will see everything. Peles Castle is not to be missed. In my opinion it was the highlight but the charm of Brasov was wonderful as well. Great time and thanks, Vlad.....we had a wonderful day! TOUR GUIDE RESPONSE: Thank you, Shari! It was a great time for me as well, good company makes the days even easier and more fun! TOUR GUIDE RESPONSE: Thank you for the rating, William! Regards from Bucharest! All tours delivered as described. Vlad is an excellent guide. Went out of his way to accomodate our requests. Brasov is a beautiful town and worth a visit. TOUR GUIDE RESPONSE: Dear Will, thank you very much for the kind words. Looking forward to seeing you again! Vlad picked me up on time and gave me a great overview of Romanian history during the drive. Both castles we visited (Peles and Bran castle in Transylania) were stunning, and the scenery was beautiful. The day was well paced with food and toilet stops an good times, and we covered so much. Vlad was good at listening to what I wanted to do and altered the schedule to fit in the things I wanted to do. It was a long day but I never felt Vlad rushed things. TOUR GUIDE RESPONSE: Dear David, thank you very much for the rating and the review. I'm glad you enjoyed the tour itself and my company as well. Looking forward to seeing you back here (more rested next time :) ). Enjoy the rest of your staying in Eastern Europe! Vlad was absolutely terrific. He was very flexible and permitted us to wander whenever we wanted. 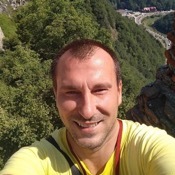 Very knowledgeable and would highly recommend Vlad for any tour within Romania. TOUR GUIDE RESPONSE: Dear David, thank you so much for your kind words! Flexibility is a key element when leading private tours. My aim is to deliver the perfect experience for my guests. Looking forward to seeing you again soon! Vlad is an awesome tour guide and his English is excellent. He got us into Peles Castle ahead of the tourist rush so that we could enjoy a detailed narrative on its history. Once the other tours showed up they rushed right past us not realizing what they were missing. On our trip to Bran Castle he treated us to some local street food, which I highly recommend to all! We finished the day with a trip to the historic town of Brasov. This is an all day excursion and Vlad really knows the history of area. Vlad is absolutely a great tour guide. His English is perfect, so no problems there. The salt mine was beyond my expectations! The wine tour was the high light of the day! After a great lunch we had the opportunity to sample 12 different wines directly from their barrels and holding tanks. I must say that all the wine we sampled were fantastic. My only regret is that we can't get those wines in the States. I highly recommend Vlad to anyone looking for a great and knowledgeable guide. Vlad is a proud Romanian very earger to show off his beautiful country. He is very knowledgable about the country today and its' history and is always willing to share it. Thoroughly enjoyed the day 6 of us spent with Vlad. We would highly recommend him as a tour guide. TOUR GUIDE RESPONSE: Dear Allan, thank you for your rating. Indeed, you got me well :). I am a proud romanian, on one hand because we do have a rich and beautiful country, but on the other hand, my father being a retired navy officer left some scarves as well :). Hope to see you soon! TOUR GUIDE RESPONSE: Thank you very much for your rating, James! Had a great tour of Transylvania. Vali was excellent and I highly Reccomemd. He was flexible and responsive to requests and very knowledgable. I will call for him. TOUR GUIDE RESPONSE: Thank you for the kind words, Bruce! Looking forward to seeing you back here, to discover some more of the beautiful Romania! Simply AMAZING :) We had 5 perfect days with our guide Vlad, who was always very friendly, nice, organized and responsible, taking us to a journey through Wallachia and Transylvania regions, full of interesting histories, not to mention the insanely beautiful breath-take landscapes! He even came with some extra surprises, that wasn't added to the initial plan. Definitely 5 stars! Vlad is one of the best guide we ever met! Thanks for the awesome days! TOUR GUIDE RESPONSE: Muito Obrigado, Marcelo! Looking forward to seeing you again here, to discover even more of our beautiful country! Hugs to the rest of the group as well! Vlad fulfilled all his promises and even went far beyond. I got a fantastic sense of Romania as a country and felt like I truly achieved a basic understanding of the culture. We spent 12 hours together and were literally conversing the entire time. He has a deep historical understanding of all of the sites we visited and shared so many details it was unbelievable. He is truly passionate about history and he enthusiastically answered every question I had. TOUR GUIDE RESPONSE: Andrew, thank.you for the kind words. I'm glad when guests leave Romania with a good impression. Plus, as i spend all that time together with my guests, why not.to make it a quality time? ;) Looking forward to seeing you again! Súper recomendado Vlad, la pasamos padrisimo y sus explicaciones fueron perfectas! Nos encanto hacer el tour con Vlad, no se arrepentiran! Tour en español perfecto! TOUR GUIDE RESPONSE: Thank you for the rating, Michelle! Have a safe trip back and looking forward to seeing you again! TOUR GUIDE RESPONSE: Thank you for the rating! Excellent full day trip! We got to see the highlights outside of Bucharest and got some shopping in too! Vlad did an excellent job! TOUR GUIDE RESPONSE: Thank you for the kind words, Mary! Hope to see you back soon! Vlad, thank you for arranging this tour for us. We truly enjoyed the wine tasting and the special treat of meeting and visiting with the vineyard owner. The restaurant was spectacular too. Thanks again! We had a very informative tour by Vlad travelling to Transylvania from Bucharest. Vlad is very knowledgeable about the country of Romania and about Constanta, as well. We visited the Black Sea on another day. Vlad's fees were very fair considering the long amount of time we were in the vehicle and the distances traveled. We felt comfortable discussing any travel topic with Vlad. We gained a lot of insight into the culture, history and outlook of the Romanian people thanks to Vlad's extensive knowledge. TOUR GUIDE RESPONSE: Dear Tony, thank you for the kind words. It was a pleasure talking to guests so interested and prepared as yourselves! Wow! What a fantastic tour. Everything went smoothly from initial booking of tour, emails with Vlad confirming tour details and the tour itself was wonderful. Vlad is an enthusiastic, knowledgeable and his love for his job and Romania itself shines through. Peles Castle is stunning. Bran Castle is everything we hoped it would be in a breathtaking location. Brasov old town is one of the most picturesque places I have ever visited. My 2 teenage sons and myself had such a great time. Thanks Vlad! TOUR GUIDE RESPONSE: Thank you, Allan, and looking forward to seeing you back!!! The four of us enjoyed our tour with Vlad, who went beyond his itinerary when he found out we hadn't been to the Old City. He took us to a very good restaurant for lunch which we all enjoyed and helped us all with our menu choices, including a traditional desert. TOUR GUIDE RESPONSE: Thank you for the rating, Richard! See you guys again soon! My daughter and I enjoy very much our 1 day tour. It was very well planned and our time was well spent. Excellent tour. Our guide was well informed and very helpful as we visited the tour sights. Again, excellent guide and tour. TOUR GUIDE RESPONSE: Thank you for the kind words! I wish you a happy new year 2018! Spent an interesting and educational day with friendly Vlad who spoke perfectly understandable English. Recommended. Vlad is very knowledgeable guide. He can tell you so many stories about all around you and Romania in general. Tour is interesting but be prepared for crowded lines. TOUR GUIDE RESPONSE: Thank you very much for reviewing the tour, Bob! Excellent tour and excellent guide. Vlad is very personable, knowledgable and well organized. This was a very long day but well worth the time and the money. I would highly recommend Vlad as a tour guide. TOUR GUIDE RESPONSE: Thank you for your kind words, Alexandria! I am glad you enjoyed your time! Looking forward to seeing you again here! Vlad is extremely well informed about the history, customs and sites in Romania. We had an absolutely excellent time with him. He was very accommodating and made extra effort to make us feel at home in Romania. I would recommend him in a heartbeat to anyone visiting Romania for the first time and looking to get a Romanian experience! TOUR GUIDE RESPONSE: Dear Andrew, thank you for your kind words. It`s been a pleasure meeting you and i hope you will soon come back for more :). Our flight was delayed by 10 hours, but Vlad worked with us to come up with an excellent tour that fit into our schedule. His flexibility was greatly appreciated. He was also helpful in finding/recommending restaurants that satisfied my husband's eating constraints (vegetarian and gluten free). I highly recommend Vlad as a tour guide. He is personable and has a great sense of humor. He is quite knowledgeable about Romania and provides great insight into the culture and history. TOUR GUIDE RESPONSE: Thank you very much for your review, Maggie. It was a pleasure knowing you guys, and i admire you for what you did and how much you fought for it... you know what i mean! All the best to all 3 of you! Vlad is a very good guide and we really enjoyed our tour of Bucharest. He is very knowledgeable and was very willing to customize the tour as needed to see things that we wanted and spend as much time as we needed. If you're coming to Bucharest and are thinking about a guide...I would highly recommend Vlad ...I'm certain he will do a great job for you. TOUR GUIDE RESPONSE: Dear Tom, thank you very much for your kind words, it`s been a pleasure meeting you guys. Looking forward to seeing you again here! Greetings from Bucharest, Vlad. Just want to say a HUGE thank you to Vlad for our recent tour - it was perfect! I contacted Vlad as I was looking for something a little different (a football tour, that no one could seemingly provide). Within 24 hours, he'd put together a bespoke tour with itinerary, and did all the timings and locations to work around us. Everyone in the group commented on how great Vlad was - massively recommend you get in contact with him if you're looking to do anything in Bucharest! Thank you Vlad!! TOUR GUIDE RESPONSE: Dear Ash, thank you for your kind words and i`m glad to see that the mediocre quality of the game didn`t have an impact on my rating :). Hope you liked Romania enough to see you again in your upcoming honeymoon :). Great guy, knows his stuff and a pleasure to have as a guide. Enjoyed this trip and he knew the places we went well. Gave good insight into the things that we saw. Very helpful for me to see it with a guide when I was out of my element in a foreign country. TOUR GUIDE RESPONSE: Thank you very much for your feedback, Tony! Hope i raised your interest in coming and seeing more :). Happy New Year!